The Enterprise limps back to Earth after its encounter with Khan. The crew, struggling with Spock’s death and McCoy’s apparent emotional breakdown, learns that the Enterprise is to be decommissioned. Meanwhile, a Klingon Bird of Prey led by the particularly nasty Commander Kruge (Christopher Lloyd) is intent on learning the secrets of the Genesis Planet, created in the previous movie. Back on Earth, Sarek (Mark Lenard) pays a visit to Kirk and (rather emotionally) asks him why he did not bring Spock’s body back to Vulcan, per tradition. The two discover that Spock mind-melded with an unconscious McCoy shortly before saving the ship, probably causing McCoy’s mental issues (either that, or he had too many Georgia mint juleps). After being refused by the head of Starfleet — one of the most officious and frustrating bureaucrats in the history of Federation bureaucrats — Kirk and Co. steal the Enterprise to retrieve Spock’s body on the Genesis Planet. Upon arrival, Kirk doesn’t find the U.S.S. Grissom — a science vessel assigned to the planet with Kirk’s son David Marcus (Merritt Butrick) and Saavik (Robin Curtis, taking over for Kirstie Alley). Instead, Kruge’s ship decloaks. The Bird of Prey, normally no match for the Enterprise, knocks out the automation Scotty set up, disabling the ship. Kirk then learns that Kruge has taken David, Saavik and Spock — reborn after his torpedo tube/coffin landed on the planet, but with no mind — captive on the planet. Kruge has David killed in a show of strength and a stunned Kirk surrenders, allowing Kruge’s officers to beam to the Enterprise. 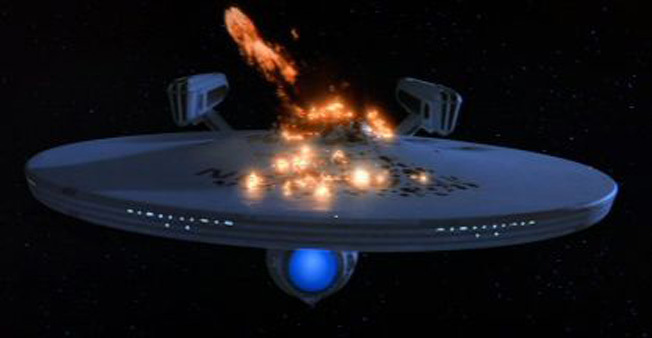 But Kirk and Co. beam to the surface, and put the ship on auto-destruct, killing most of Kruge’s crew. After watching the Enterprise die in the planet’s atmosphere, Kirk and Co., find Saavik and Spock, but Kruge beams down and has everyone but Kirk and Spock taken captive on the Bird of Prey. As the Genesis Planet starts to come apart — David used an unstable material in his work, making the experiment a failure — Kirk and Kruge fight, with Kruge eventually falling to his death. At the last second, Kirk fools the remaining Klingon on the Bird of Prey to beam him and Spock aboard, and Kirk takes command of the ship, leaving orbit as the planet explodes. They then head to Vulcan, where an ancient ritual is used to take Spock’s “katra” from McCoy and put it into Spock’s body. The film ends with a reborn Spock recognizing Kirk and being greeted by the rest of the crew. “The Search for Spock” is the middle part of what really is a trilogy of the second, third and fourth Trek movies. 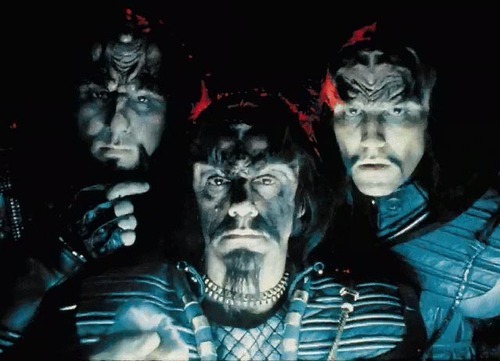 Other than bringing one of the franchise’s core characters back from the dead, it’s probably most important in furthering the redone Klingons — they’re more warrior-like here than ever before — and setting up the Kirk/Klingon rivalry that permeates the next three films. In fact, the new take on the Klingons is huge going forward. As noted in previous reviews, Klingons in the original series, by and large, were more like treacherous sneaks (think Ferengi) than warriors. Kruge and his crew aren’t honorable, like the Klingons we see in TNG, but the Bird of Prey clearly is filled with ballsy fighters. It’s actually a good change, if it’s an evolving one. We also hear much more of the Klingon language. Kirk taking possession of the Bird of Prey and the crew’s status as renegades going into the fourth movie is important, too. It puts them in the position (outside Starfleet) to go back to 20th-century Earth and recover two humpback whales to answer the call of a probe that is threatening the planet in “Star Trek IV: The Voyage Home”. More on that next week. And, obviously, the rebirth of Spock is huge. Without him, it’s unlikely that the crew would have saved Earth in the next movie — or that the peace initiative with the Klingons would have happened in “Star Trek VI: The Undiscovered Country”. There’s also the business with Spock on Romulus in TNG and the possible ramifications of that in the rebooted “Star Trek” in 2009. Oh, and the Enterprise gets destroyed. There are a handful of continuity issues, mostly stemming from the choice to have this film take place just days (weeks?) after the previous one. Hairstyles and the general look of the ship don’t quite line up (somehow, the crew got a new type of phaser between Genesis and Earth). There’s also the odd line about the Enterprise being “20 years old” — which is just way, way off. At this point in Trek, the ship is about 40 years old, though it was refitted 13 or so years before the events of this movie. But those items are mostly forgivable. And, I suppose, I could call out the creators for revamping the Klingons. In this case, I guess I’ll shrug it off and assume that most Klingons are like Kor from “Errand of Mercy” or Kang from “Day of the Dove,” as opposed to the nameless Klingons in “Friday’s Child” or “A Private Little War.” It might be a reach, but when the creators have two choices and make the right one, I’ll cut them some slack. I actually think that the third Star Trek film doesn’t get nearly enough love. It’s not as good as “Wrath of Khan”, but it’s not that far off — even if the stuff on Vulcan is kind of slow. 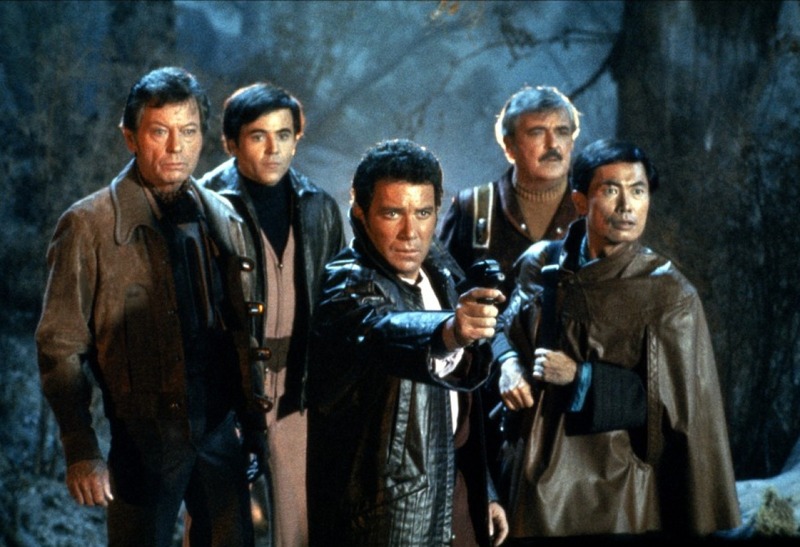 With the old thinking that odd Star Trek films are always worse than the even ones, “The Search for Spock” is arguably the best of the odds (unless you dig all the trippy stuff in “The Motion Picture”). This movie does have a lot of great scenes. The theft of the Enterprise is one of the most engaging moments in the film series and the destruction of the Enterprise is quite affecting (Shatner nails it with, “My god, Bones. What have I done?”). Kruge clearly isn’t the villain that Khan was, as he’s far less complex. But he does the job. I’ll take a two-dimensional Klingon over a laughing Vulcan or a weird energy cloud any day. Lastly, this is the first time we see the iconic Bird of Prey. It’s really one of the coolest ship designs Star Trek has ever produced — and it pops up in the next three movies and in all of second-generation Trek (aside from the prequel “Star Trek: Enterprise”). Come to Trek Tapestry. You might have a whale of a good time!